Are you looking for a reliable contractor, someone with the construction & design experience necessary for great home improvements in Santa Clarita, California? My Space Remodeling has what it takes for a great kitchen remodel or bathroom remodel. Also we are experienced in room additions, including sunrooms. 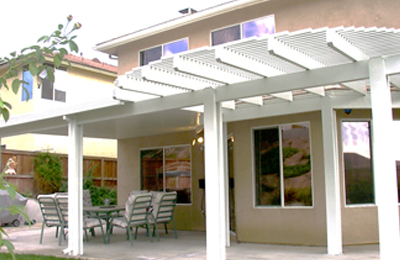 Whether you have a smaller lot in the Valencia or Newhall areas or a larger lot out in Canyon Canyon Country and Saugus, we’ll enhance your Santa Clarita outdoor living with patio covers, outdoor kitchens, gazebos, and decks. It can be time consuming and expensive to upgrade your lifestyle by moving up to a new house. Instead almost everyone chooses a remodel or room addition remain delighted with that choice. But there are a few things you need to do in order to be sure that everything goes as planned. You need to become completely comfortable with your decision. That really boils down to how happy you are where you’re now located, how you feel about the disruptions of selling, buying, and moving, and whether you can really get what you truly want within your budget. If you want some numbers, Realtor.com, Trulia, and Zillow put actual selling prices in Santa Clarita at a median $470K, $460K, and $478K respectively for a cost per square foot of roughly $275. The prices you see advertised (asking price) is typically some 5 to 10% higher. Really think through exactly what you want. That’s not just a style and a few features you want most. Consider how you’ll use the room, where windows and doors should be, and what sort of appliances, fixtures, and lighting you want. Never skip permits. They’re there to protect you and future homeowners. The process adds to cost and may take as long as a month, but otherwise you risk having your home improvements stopped mid-way, and will have problems when you go to sell. Choose a top-reputation contractor and experienced designer. Hiring a general contractor means that all responsibility rests with a single company, and you won’t be scrambling to coordinate the various stages and specialties yourself. 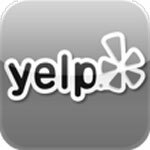 They should be insured and licensed for all work you need in Santa Clarita, so take the time to verify this. If at all possible, talk to a few of their previous clients (references) and see how things went. By insisting on permits and inspections, you’ll have an objective review of design details and assurance that work is done properly and up to code. 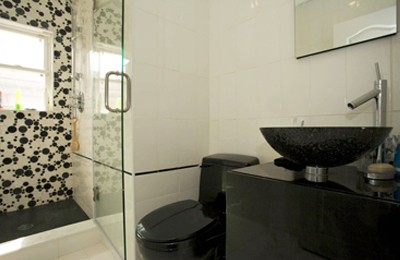 Do you face crowded bathrooms every morning or have too much to fit comfortably in the family room? If your current living space simply isn’t big enough a room addition is usually better solution than moving. If you only have one, then a second bath is simply a must. With a little bit of planning a room addition can grow with you — a playroom can later becomes an entertainment or family room and later still a den, study, or home office. Master suites are also popular in Santa Clarita, as are mother in law suites and attached apartments. To preserve outdoor living areas by building up with a second story addition, zoning laws permitting. Costs are usually a bit higher, with even attic conversions often requiring structural reinforcement. Our patio enclosures are a very economical way to add long-lifetime great-looking space that is energy-efficient and comfortable throughout the year — forget old designs and cheap kits. Our room additions work harmoniously with the existing structure, inside and out. 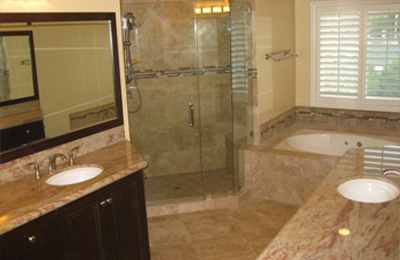 If your bath is not a thoroughly enjoyable space, then it’s time for a bathroom remodel. You could soon be ending each day with a relaxing rainfall shower in a spacious walk-in shower with custom tile and the latest features. Or pampering yourself in a jacuzzi tub sunken into a natural stone platform. 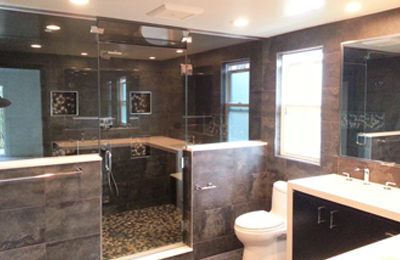 A complete bathroom remodeling project makes a big difference in your life! Just choose a scale and style and we’ll make it happen. With access to natural light, a bright and cheerful country style with gleaming tile is a natural choice for Santa Clarita. Or perhaps you prefer something modern with clean lines and sleek elegance. How about traditional or old-world themes for more than a bit of glamor. Whether an update or a complete bathroom remodel with a new layout, we’ll work with you to create the perfect design, coordinating colors, lighting, tile and natural stone, and fixtures ranging from farmhouse-retro to the latest in designer sinks and faucets. Whether you’re after a complete kitchen remodel with a totally new layout or just an update in kitchen cabinets and counter tops we deliver with outstanding designs and workmanship. 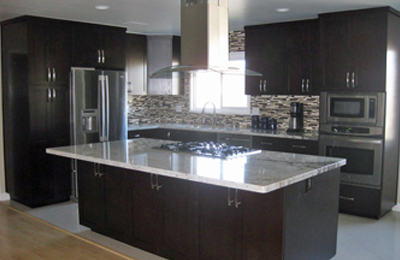 So what look are you after for your Santa Clarita kitchen remodel? 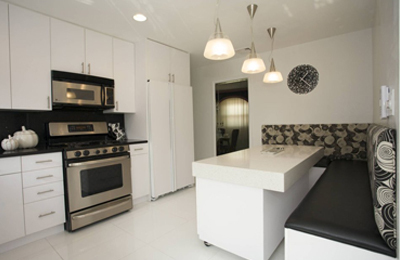 If you’re a gourmet or simply like the style, perhaps an echo of a fine restaurant, with stainless-steel sinks and fixtures together with professional-grade appliances. Maybe you want a spacious farmhouse kitchen remodel, or a cozy and convenient contemporary layout featuring granite countertops, glass tile back splashes, and kitchen cabinets with glass doors. Perhaps an ultra-modern style with the latest in designer sinks and fixtures. Whatever you choose we’ll make it beautiful with just the right choices of colors, materials, fixtures, and appliances to create your dream kitchen. Our designers and crews are also experts in adding to backyard experiences. People who choose do-it-yourself kits usually wind up spending far more time than they expected, and often end up with disappointing results. Let our experience blow past that with superior gazebos, outdoor kitchens, patio covers, and wood decks. We’re home remodeling professionals, with skilled and experienced designers, crews, and project managers for great results and a great experience. Fully licensed and insured for work in Santa Clarita, we’ll complete the permit and inspection process for code compliance, assuring you of quality for years to come. You’ll recognize our dedication to technical excellence and great customer service right from the start with a no-charge consultation and estimate. As a general contractor we’ll work within your budget and take care of everything from carpet to roofing — you simply won’t have the hassle of dealing with multiple companies for construction, plumbing, electrical, and so on. Nor any loose ends. We’re particularly well known for our marble and granite, tile, and wood floor expertise. We’ll provide easy payment terms, and on approved credit can provide 100% financing. And we guarantee your satisfaction.